Whatever disasters and disappointments the twentieth century might have seen, the quality of poetry emanating from the British Isles throughout this time remained generally very high - W.B. Yeats, T.S. Eliot, Louis Macneice, David Jones, David Gascoyne, Kathleen Raine, Elizabeth Jennings - the list goes on. Not all twentieth century poets were as spiritually attuned as the 'magnificent seven' named above, of course, but the very existence of such a 'cloud of witnesses' during this age of philosophical materialism should surely give us cause for hope. The spirit 'bloweth where it listeth' and God will always find a way to make His presence felt, no matter how dark the epoch. Alexander Solzhenitsyn's writings on the Soviet labour camps are terrific examples of this. 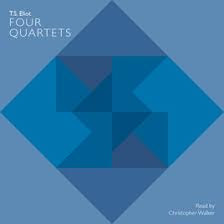 There's no finer English (or Anglo-American to be precise) example, to my mind, than Eliot's Four Quartets. This sequence of interlocking poems - Burnt Norton (1936), East Coker (1940), The Dry Salvages (1941) and Little Gidding (1942) - is especially worth reflecting on at a time like the present, with storm clouds gathering and the drums of war pounding. They give comfort in a time of darkness, just as they did in the Second World War. They acknowledge the darkness too. They don't pretend it isn't there. But they're not intimidated and overmastered by it, as Denethor was by Sauron in The Lord of the Rings. Neither do they offer platitudes and facile solutions. They simply show - in rich, sonorous, almost liturgical language - how that darkness can and must be defeated. The goal is the rediscovery of that centre which Yeats felt the modern world had lost. This is an inner centre - 'the still point of the turning world', as Eliot calls it - the secret, silent place where the creative logos - Christ Himself - sits enthroned in the depths of our hearts. It is a personal rather than a corporate rediscovery, based on a Dostoyevskyan recognition of the colossal importance placed on the value of each and every human soul by both God and the Devil. C.S. Lewis does something similar in The Great Divorce when he depicts the angelic powers, both good and evil, playing for the eternal future of living souls on a giant chessboard. The way to this 'still point', for Eliot, is through a reconnection with history and place. These are the things that anchor us, that connect us to the Real, and both have been continually undermined since Four Quartets was written, and with dizzying speed since the end of the Cold War in 1991. A triumphant Liberalism has defined the greatest good imaginable as the individual's right to choose, whether as a consumer in the unfettered free market or as a 'liberated' self in the wider cultural and social sphere. 'All that is solid melts into air', said Karl Marx about capitalism, and that is one thing - perhaps the only thing - that he got right. We have slipped our moorings completely. Our roots have been cut from under us. All the things that gave us a solid, stable identity from which we could face the world in confidence and strength have been belittled and diminished - belief in God, love of one's homeland, a happy family life, meaningful work, even bodies like Trade Unions and workers guilds, which looked after the labourer and artisan, ushering him or her into something grander than the 'daily nine to five' - a lineage and tradition which gave work a wider context and meaning. Now even something usually so rock-solid as one's gender is being called into question. @John - This is aside from your main point, but it is interesting how the essence of poetry can be so different - our favourites don't seem to overlap at all! For me, poetry is rooted in song, the lyric - often short: my definitive anthology is Palgrave's Golden Treasury of Verse. I've probably missed-out some important ones, but that gives the flavour of my personal pantheon! It has always interested me that Eliot should be favored by people who, in most major respects, hold diametrically opposed values: Leftist academics and the spiritually earnest who lean toward Christianity. I think his appeal to the first rests in his inaccessibility. It is snob appeal. Eliot's erudition was remarkable and he made full use of it. This, alone, cuts him off from most of his posterity. The spiritually earnest, I think, find in him bits and pieces of things that resonate with their own desire for meaning beyond materialism. It has always seemed to me there is something funereal in his verse: he is always, in some way, mourning the loss of a culture whose products he valued, although he never lived in that culture, for it was long gone before he appeared in the American Midwest and went on to Harvard. Americans have little, if any, sense of history and few of us are rooted to a particular place. There is no chapel we can kneel in where "prayer had been valid." I think Eliot may represent that longing for a sense of place, a sense of belonging in the world, that we, his countrymen, so lack. Perhaps that's why he went to England and tried to forge a new identity. But I think that Providence is, in a sense, forcing us out of the world, denying us a comfortable home in it, now as never before. The poets in the 20th century were something like canaries in the coal mine: they were telling us the air of our world was no longer fit to breathe. But where else can we live? Perhaps, poetry reached its limits in Eliot, at least for now. Something new may be taking shape, but much that is decayed and cluttering the landscape will have to be cleared away somehow.